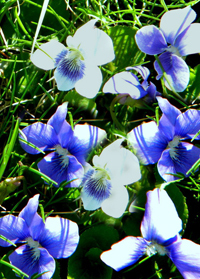 Incredible blue flowers on narrow, silvery-green foliage creates an amazing display. Slightly mounding growth habit. Sharp drainage is a must and performs best in moderate temperatures. 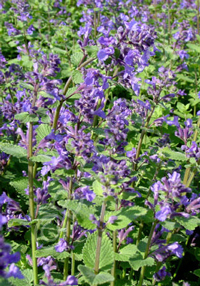 Dark lavender-blue flower spikes bloom repeatedly in summer when cut back after each wave of bloom. 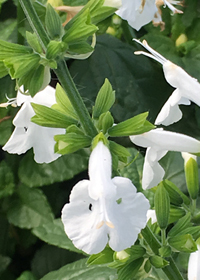 The aromatic gray-green foliage stays compact and makes this plant a great choice for edging or for the front of the border. Perfect for shady, moist locations, 'Trevi Fountain' lights up the darkness with its narrow green leaves spotted with silver. Clusters of deep cobalt-blue flowers appear in early spring. 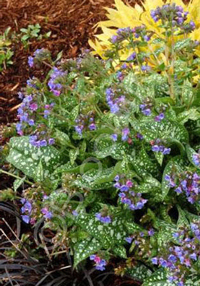 The foliage is heat tolerant and mildew resistant. 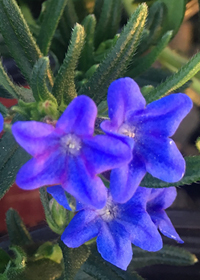 Each petal is suffused with blueberry-blue spreading from the center. Flowers have a light, sweet fragrance and rise above heart-shaped leaves. A plethora of pure white flowers crowd along spiked stems from spring to frost! Large flowers attract hummingbirds and bees alike. This 2015 All-American Selections winner bounces back right after heavy rains or wind. 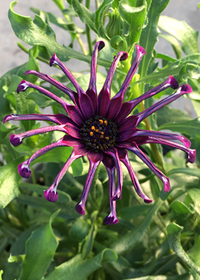 An African Daisy with loads of personality! 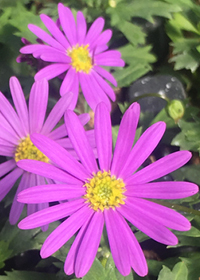 Purple petals are shaped like little spoons as the middle sections are rolled but then open up at the tips. 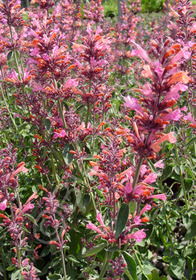 Plants are well branched and do exceptionally well in containers and beds during the heat of the summer. Attractive to butterflies! 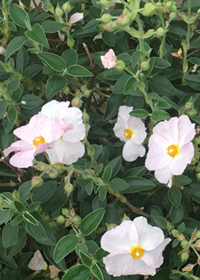 Pale pink, papery blooms and aromatic foliage are reasons enough for choosing this beautiful cistus! Perfect for dry, well draining soils that do not get watered during the summer. Large, creamy lavender colored petals are topped with darker berry blue florets giving this Osteo a 3 (or 4? )dimensional appearance! Highly floriferous and well branching. Blooms non-stop till frost. 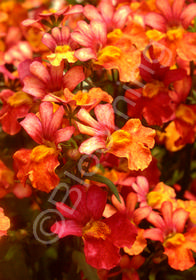 This semi-trailing and compact growing Brachyscome is perfect for containers and hanging baskets. Violet-lavender daisies over dark green fine cut foliage creates an attractive back drop for other annuals in mixed plantings. Great for attracting butterflies and bees!